With a new school year comes new school lunches. Being a picky eater means that Kid won’t eat the cafeteria food. He also won’t eat the same thing two days in a row, or even twice in the same week! So, if I’m going to serve the same-old, same-old, I have to make it super cute or interesting in some way. 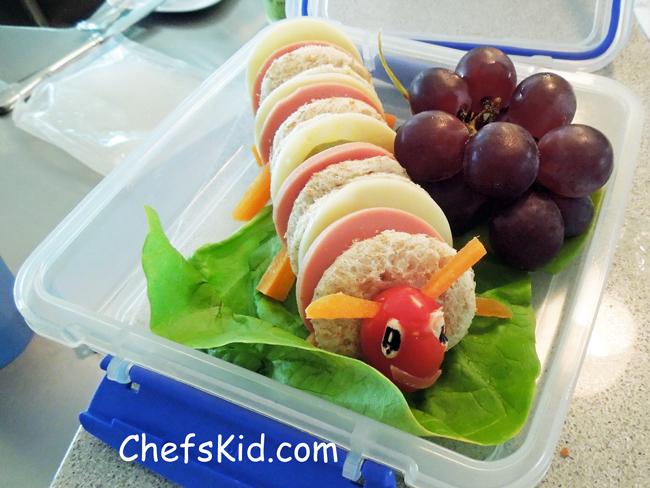 The Hungry Caterpillar Sandwich was one of his favorites. Luckily, he’s an artist, so he appreciated the artistry involved. The trick to keeping it looking cute all the way to school – even through a long bus ride, and surviving the big bin where they all throw their lunch boxes when they enter the classroom – is to use a shallow container (we use Sistema Klip-it) and add extra items to keep it in place… in this case – grapes. Doing this meant he still had this cute little guy at the lunch table instead of a scattered mess-in-a-box. Using a 2-inch biscuit cutter, cut the bread slices to get 8 rounds. Cut bologna and cheese into 4 rounds each using the same cutter. Layer bread, pickle, cheese, bologna, and bread, buttering the insides of the bread only, until you have 4 little sandwich stacks. Slide the skewer through the centers of each sandwich to resemble the photo and set aside. With a sharp knife, make two small slits in the top of the tomato and insert a carrot matchstick into each slit. Make two more slits to the 'front' where you want the 'eyes' to go and press a dry black-eyed pea into each slit to make the eyes. Cut a small smile from the bologna scraps and 'glue' it onto the tomato with the butter. Place a lettuce leaf on the bottom of a shallow sandwich container (we use Sistema's Klik-it system). Lay the sandwich skewer on the lettuce leaf carefully. Add carrot matchsticks for legs. Add the head to cover the sharp end of the skewer. Add grapes to help fill the container - which helps keep it in place - secure the lid and you're good to go!